Hi. I’m Mark Boehm, New Business Development Manager for PolicyWorks. 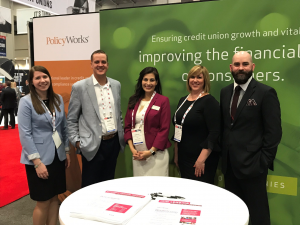 Not only am I new to PolicyWorks, I’m also new to the credit union industry, so I wasn’t quite sure what to expect when one of my first tasks on the job was to attend the CUNA Governmental Affairs Conference – GAC – in Washington. After 12 years in mortgage banking, and attending lots of banking-related conventions and conferences along the way, I have to say that GAC was a breath of fresh air. It was an immersion into the world of credit unions after only three weeks on the job for PolicyWorks. It confirmed all of what I suspected about the credit union industry: There are a lot of really genuine people out there. I had some exposure to credit unions in the past, thanks to several banking colleagues who had moved over to “that side” of financial services. From what they told me, credit union work seemed more sincere, really focused on the members. GAC offered the opportunity to really see if that was the case. It sure is. The atmosphere reminded me of the small Iowa town that I grew up in, very community-centered. The people I spoke with at GAC reflected that. All that they talked about demonstrated that they live and breathe that sense of community, not just among their members but among other credit unions as well. As far as compliance, what I came away with from our discussions is a real understanding that what has made credit unions successful so far will not necessarily be enough to keep them successful. The pace of change, and the increasing complexity when it comes to compliance, are requiring a lot of credit unions to rethink their approach and be more proactive. Without a doubt, those credit unions that take a proactive and forward-looking stance on compliance are going to be far better positioned for growth. It was really enlightening to see how proud these credit union leaders are of the history of their institutions, from how they got started to where they are today. I’m curious by nature, and I found it fascinating to talk in depth with so many leaders from credit unions across the country. While it was energizing for me personally to spend time with so many credit union leaders at GAC, the PolicyWorks team had many opportunities to tell our story and to hear from individuals about what they deal with every day as they manage their credit unions and focus on member service, member satisfaction, and growth. Hopefully, we all left a good impression and will have the chance to talk more with these credit unions about how we can help them stay compliant enroute to achieving those objectives. As for me, I’m already looking forward to GAC 2020.